Background and Objectives: Orthodontists have always strived to develop a new technique to reduce the treatment time with minimal patient cooperation. Canine distraction was introduced as an alternative technique for canine retraction in a minimum possible period of 3 weeks, thus avoiding taxing the anchorage by molars since the canines are retracted within the lag phase of molars. It has been proved by numerous studies that the bone mesial to canine after rapid canine distraction through the extraction socket is a new and immature. The objectives of this study were to evaluate the rate of retraction of anterior teeth, the time taken, and anchorage loss during the retraction of anterior teeth into this newly organized bone. Methods: Six orthodontic patients who required first premolar extractions were selected. Undermining of the interseptal bone distal to the canine was done, and canines were retracted into the extraction space of the first premolar, using a custom-made tooth borne intraoral distraction screw, following which the incisors were retracted into the newly formed bone using closing loops. The patients were called at weekly intervals to measure the amount of space left between canine and lateral incisor, and the rate of retraction was calculated after space was closed. Results: The present study showed that the rate of retraction of mandibular and maxillary teeth was 0.74 ± 0.39 mm and 0.73 ± 0.15 mm/week, respectively. The anchorage loss was found to be 1.83 ± 0.29 mm and 2.08 ± 0.38 mm in mandibular and maxillary arches, respectively. The time taken to retract the incisors was found to be 40.3 ± 1.5 and 41.7 ± 0.6 days for mandibular and maxillary arches, respectively. Interpretation and Conclusion: Retraction of incisors is faster in both maxillary and mandibular arches when the incisors are retracted immediately into the immature bone created after canine distraction. Tooth movement occurs by the process of anabolic and catabolic remodeling followed by modeling of bone. The average rate of retraction of anterior teeth during orthodontic tooth movement is 1 mm/month. Inadvertent anchorage loss can prevent correction of anteroposterior malocclusion and lead to a compromise in the desired treatment goals. Reitan , in their study reported that a certain degree of root resorption occurs in patients undergoing orthodontic treatment and the root resorption is related to long treatment duration. There has always been a need in clinical orthodontics for faster tooth movement to decrease the treatment time. Liou and Huang  used the concept of distraction osteogenesis to rapidly move the canines into the premolar extraction space through the distraction of periodontal ligament and coined the term “dental distraction.” He reported that canines can be moved into extraction sockets of bicuspids, within the lag phase of molars, after which the molars start migrating mesially. The distraction of periodontal ligament applies the basic principles of distraction osteogenesis, which was described as long as ago 460-377 BC during Hippocrates era when traction on long bones was performed by means of rubber straps. McCarthy et al. first applied distraction ontogenesis to the mandible. Liou et al. hypothesized that the rate of retraction into newly distracted bone is faster. This hypothesis was supported by Nakamoto et al. and Sayin et al. who concluded that bone distal to lateral incisors is immature and fibrous, so it is faster to retract incisors into this bone. The present study was undertaken to study and determine the rate of retraction of anterior teeth into fibrous and immature bone after canine distraction. Six patients requiring orthodontic treatment with a mean age of 18.6 years were included in the study. All the patients required first premolar extractions and maximum retraction of anteriors either in the maxilla or mandible. The posterior segments of these patients were well-aligned and anterior crowding of <5 mm was present. The anterior teeth were periodontally healthy without infra-bony defects. Twelve canine distractions (six upper and six lower canines) were carried out using a custom-made tooth-borne intra-oral distraction appliance. The appliance was made of stainless steel and consisted of a principal screw of 15 mm length with two bars. One bar was stabilizing and the other was of sliding type. Stainless steel wires of dimension 0.021” × 0.025” inches were attached to both the bars. The pitch of the screw was 0.4 mm [Figure 1]. The distraction screw was activated using a custom-made screwdriver. This was followed by retraction of the anterior teeth. Banding of first molars and bonding of the entire arch was done using 0.022” MBT appliance. Lingual cleats were welded on the molar band, and lingual buttons were bonded on the canine. The incisors were aligned segmentally. No wire was placed in the canine and molar attachments till the canines were distracted. After the segmental alignment of incisors, the premolars were extracted. Immediately after premolar extraction, the interseptal bone distal to canine was undermined with a bone bur, grooving vertically inside the extraction socket, along with the buccal and lingual sides and extending obliquely toward the base of the interseptal bone to weaken its resistance [Figure 2]. The distraction screw was placed and activated immediately after the undermining of the interseptal bone at premolar extraction site. The wire attached to the sliding bar of the distraction screw was engaged into the canine bracket, and the wire attached to the stabilized bar was passed through the molar tube and bent gingivally at the distal end. The wire in the canine bracket was tied with the ligature wire. The screw was activated by giving two turns per day. The elastomeric chain was placed between the lingual attachment of molar and canine to prevent rotations and to provide control over the distraction since the screw was placed buccally to the center of resistance. The activation was carried out till the premolar extraction space was closed. After the canines were successfully distracted, the retraction of anteriors was started using loops made in 0.019” × 0.025” TMA wire. The activation of the loops was carried out every week till space was closed [Figure 3]. The canine and anterior teeth were checked for vitality with electronic pulp tester before and after treatment. The distance between the contact points of the canine and lateral incisor (amount of retraction) was recorded with a sliding caliper (Dentaurum, Germany). This was done directly in patient's mouth after distraction of canines, and every week until retraction of anteriors was complete. The rate of retraction was calculated by distance divided by time. Lateral cephalometric radiographs were taken after the distraction of canines and after completion of retraction of anteriors. Cartesian coordinate system measurements  were used to measure the mesial movement of molars on the tracing of the cephalogram. Horizontal measurements include y-axis (drawn perpendicular to x-axis [7° to SN plane]) to the molar mesiobuccal cusp tip. Descriptive data were presented as mean ± SD and range values. Paired t-test was used for comparison of the rate of retraction of anteriors between consecutive weeks. The value of P≤ 0.05 was considered to be statistically significant. One of the patients reported pain and five patients reported some discomfort due to the bulkiness of the distraction appliance. Ulceration on the buccal mucosa was seen in two of the patients. Slight pressure on teeth was felt by the patients on activation of the screw, but it lasted for only a short duration. The upper and lower canines were distracted distally into the extraction socket of first premolars 6.33 ± 0.41 mm within 3 weeks [Table 1]. 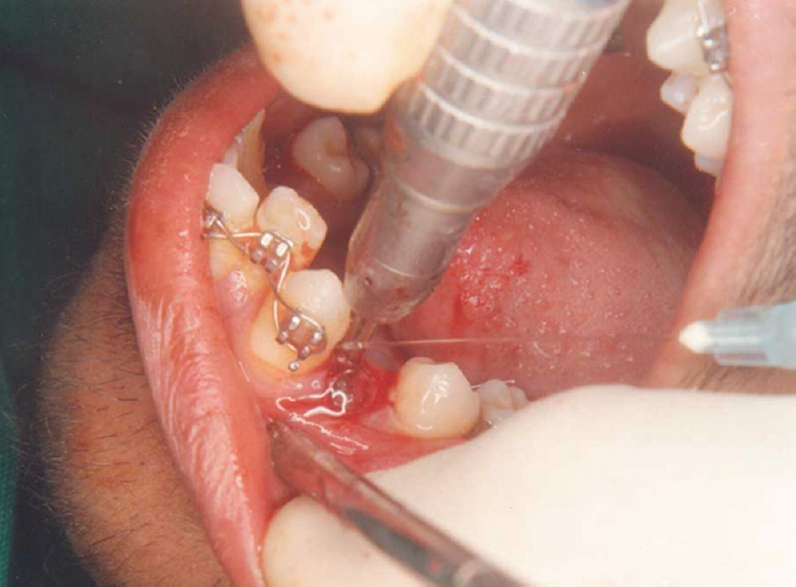 Rotation, tipping, and extrusion of the canines by 0.5–1 mm were seen in all the cases. After distraction of the canines, space created distal to lateral incisor was closed using loops incorporated in 0.019” × 0.025” TMA wire. The space closure was started immediately after canine distraction. Space closed as a result of both retraction of anteriors and mesial movement of molars. The average rate of space closure in both the arches was 1.06 ± 0.07 mm/week [Table 1]. The average rate of retraction of anterior teeth in the maxillary and the mandibular arch was 0.73 ± 0.15 and 0.74 ± 0.39 mm/week, respectively. 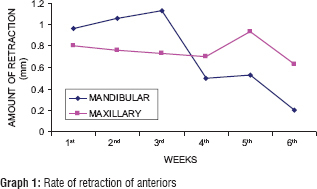 The cumulative rate of retraction of anterior teeth in maxillary and mandibular arches was 0.73 ± 0.28 mm/week, respectively [Table 2] and [Graph 1]. The mean time taken to retract the anteriors in the mandibular and maxillary arch was 40.3 ± 1.5 and 41.7 ± 0.6 days, respectively. The cumulative time taken by maxillary and mandibular anterior teeth for retraction was found to be 41.0 ± 1.3 with a range of 39–42 days [Table 3]. The molars moved mesially by an average of 1.83 ± 0.29 mm in the mandibular arch and 2.08 ± 0.38 mm in the maxillary arch [Table 4]. All the canines and incisors gave a positive response to the electronic pulp tester before and after distraction and retraction. Conventional orthodontic treatment with fixed appliances relies on biological tooth movement. Orthodontic tooth movement is a process in which a mechanical force is applied to induce alveolar bone resorption on the pressure side and deposition on the tension side. The time required for tooth movement within the alveolar bone may lengthen the overall orthodontic treatment time. Using conventional techniques, biological tooth movement can be achieved at a limited rate. Individual factors such as optimum force turn over in periodontal ligament, and bone metabolism plays a role in the determination of the rate of tooth movement. Minimizing orthodontic treatment time and controlling anchorage loss are common aims of the research. Canine distraction is a procedure in which the canines are retracted fully in the premolar extraction space within 2–3 weeks after premolar extraction. The rapid distraction of canines occurs in the extraction socket which is not yet refilled with new mature bone. This rapid distalization of canines through the extraction socket is carried out while the posterior teeth are in a lag phase and are resistant to mesial movement  thus preserving anchorage. A study by Liou et al. found that a tooth can be moved into the fibrous new bone created by the distraction process at a rapid rate and that the best time to move the tooth is immediately after the end of distraction. Cope et al. indicated that tooth movement can be performed through bone regeneration. According to Nakamoto et al. and Sayin et al., the bone created by distraction osteogenesis is fibrous, immature, and the tooth movement is faster in a regenerated bone. Liou et al. demonstrated in mature beagles that the best time to initiate tooth movement was immediately after distraction when the edentulous space is still fibrous. The present study evaluated the rate of retraction of anterior teeth immediately after canine distraction. It was found that the average rate of retraction of maxillary and mandibular anterior teeth was 0.73 ± 0.28 mm/week. The retraction of incisors was both by bodily as well as tipping movement. The value was statistically significant and shows that the rate of retraction of anterior teeth in an immature bone is faster as compared to conventional methods of retraction. In the present study, no anchorage loss was noted during canine distraction. This was because the canines were distracted within the period of lag phase of molars. The distraction of canines during the lag phase of molars leads to minimal anchorage loss.,,,,, The lag phase in orthodontic tooth movement can be described as the period of minimal tooth movement that persists for approximately 2–3 weeks after the initial tooth movement. During this period, the necrotic tissue created by high orthodontic force is eliminated by undermining resorption. The elimination of this necrotic tissue takes 2–3 weeks, which is the lag period during which no or minimal tooth movement occurs. After the lag phase is over, tooth movement again proceeds. However, Sukurica et al. reported 0–3 mm of anchorage loss during canine distraction. During the retraction of anterior teeth, after the canines were successfully distracted, the molars moved forward (anchorage loss) by an average of 1.96 ± 0.33 mm in both the arches. Anchorage loss was seen in the form of mesial tipping of molars. In their study, Sayin et al. hypothesized that anchorage loss could be minimized if there is a consolidation phase after canine distraction and before retraction of anteriors. The issue of consolidation phase after canine distraction has to be evaluated extensively. In the present study, there was no consolidation phase, and anteriors were retracted immediately after canine distraction, and 1/3rd anchorage loss was seen. The conventional methods of retraction of anterior teeth into the extraction spaces are time taking procedures because the average rate of biologic tooth movement with optimum mechanical force is approximately 1–1.5 mm in 4–5 weeks. The process of retraction is by resorption and deposition of bone. The resistance to tooth movement through alveolar bone is high, and hence, the average rate of tooth movement is slow, thereby lengthening the overall treatment time. In this study, the average cumulative rate of retraction was 0.73 ± 0.28 mm/week because the bone distal to lateral incisors was immature and newly formed, so the resistance to the movement of anteriors was less. The range of time taken for retraction of anteriors in the maxillary and the mandibular arch was 39–42 days, thus reducing the overall treatment time. The findings of this study were found to be similar to the studies carried out by authors,, who concluded that the time taken will be less as the rate of retraction is faster in immature and fibrous bone. 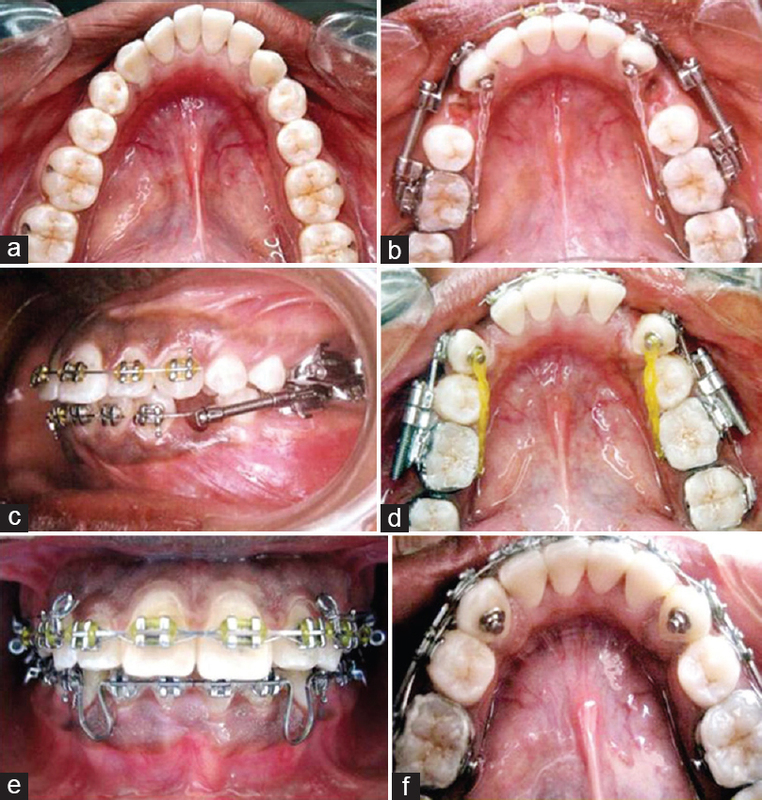 One-third of the space was lost due to mesial movement of molars so additional measures to control anchorage loss should be undertaken in high anchorage cases. Nanda R. Biomechanics in Clinical Orthodontics. Philadelphia: Saunders;1996. p. 162. Reitan K. Some factors determining the evaluation of forces in orthodontics. Am J Orthod Dentofac Orthop 1957;43:32-45. Reitan K. Tissue behaviour during orthodontic tooth movement. Am J Orthod Dentofac Orthop 1960;46:881-900. Liou EJ, Huang CS. Rapid canine retraction through distraction of the periodontal ligament. Am J Orthod Dentofacial Orthop 1998;114:372-82. Kharbanda OP. Orthodontics: Diagnosis and Management of Malocclusion and Dentofacial Deformities 1st Ed. ; Elsevier: India; 2009. Liou EJ, Figueroa AA, Polley JW. Rapid orthodontic tooth movement into newly distracted bone after mandibular distraction osteogenesis in a canine model. Am J Orthod Dentofacial Orthop 2000;117:391-8. Nakamoto N, Nagasaka H, Daimaruya T, Takahashi I, Sugawara J, Mitani H, et al. Experimental tooth movement through mature and immature bone regenerates after distraction osteogenesis in dogs. Am J Orthod Dentofacial Orthop 2002;121:385-95. Sayin S, Bengi AO, Gürton AU, Ortakoǧlu K. Rapid canine distalization using distraction of the periodontal ligament: A preliminary clinical validation of the original technique. Angle Orthod 2004;74:304-15. Ellen EK, Schneider BJ, Sellke T. A comparative study of anchorage in bioprogressive versus standard edgewise treatment in class II correction with intermaxillary elastic force. Am J Orthod Dentofacial Orthop 1998;114:430-6. Kişnişci RS, Işeri H, Tüz HH, Altug AT. Dentoalveolar distraction osteogenesis for rapid orthodontic canine retraction. J Oral Maxillofac Surg 2002;60:389-94. Cope JB, Harper RP, Samchukov ML. Experimental tooth movement through regenerate alveolar bone: A pilot study. Am J Orthod Dentofacial Orthop 1999;116:501-5. Kumar PS, Saxena R, Patil S, Keluskar KM, Nagaraj K, Kotrashetti SM, et al. Clinical investigation of periodontal ligament distraction osteogenesis for rapid orthodontic canine retraction. Aust Orthod J 2009;25:147-52. Kurt G, Işeri H, Kişnişci R. Rapid tooth movement and orthodontic treatment using dentoalveolar distraction (DAD). Long-term (5 years) follow-up of a class II case. Angle Orthod 2010;80:597-606. Hixon EH, Atikian H, Callow GE, McDonald HW, Tacy RJ. Optimal force, differential force, and anchorage. Am J Orthod 1969;55:437-57. Işeri H, Kişnişci R, Bzizi N, Tüz H. Rapid canine retraction and orthodontic treatment with dentoalveolar distraction osteogenesis. Am J Orthod Dentofacial Orthop 2005;127:533-41.